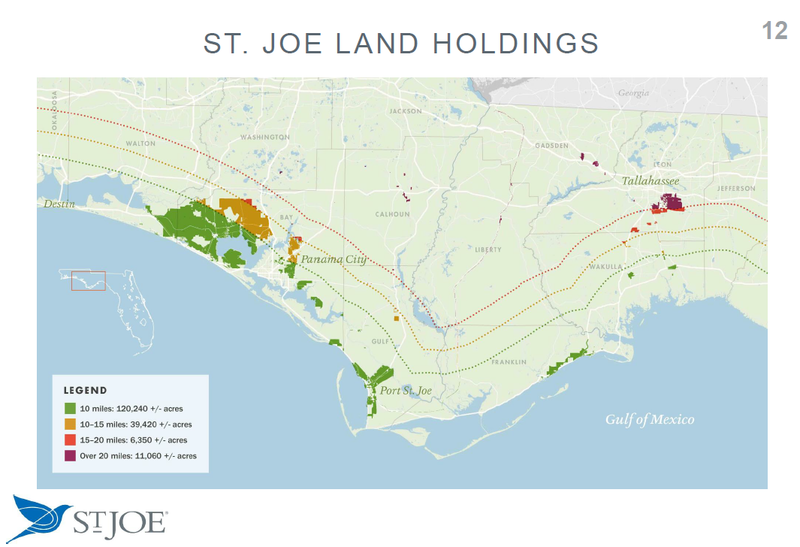 JOE is an early-stage REIT-like company that owns 177,000 acres in the panhandle of FL. JOE’s stock price has been a value trap for decades. Trapped between a large asset value vs. excessive corporate overhead and low recurring net profits. JOE’s corporate cost structure is now in line with recurring revenues. Corporate overhead has dropped from $97.4m (2007) to $20.6m (2018). Capex per employee is currently at a record high. For the first time since we have been following JOE, we can do a back of the envelope calculation and see how the value of the company could go up. 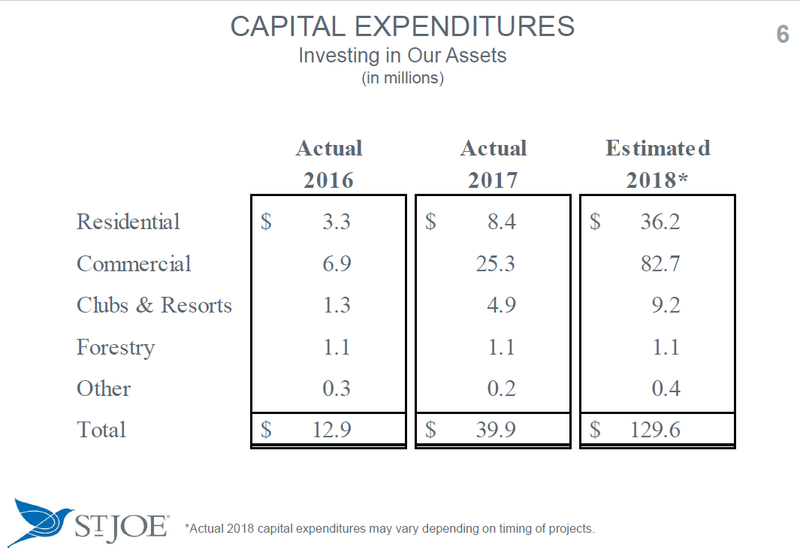 JOE’s development project spending in the next two to three years, in our estimate, will be close to the total project development spending for the last 10 years ($278M). The Panhandle of FL has recovered from the housing crisis. St. Joe (NYSE:JOE) has aligned their cost structure and, for the first time, has operating leverage. Because of the poor performance of the stock and capital spending missteps and high corporate overhead of the past, many investors have given up on JOE generating sustained profits. JOE's current strategy of targeted capex and JV partnering, combined with new opportunities, puts the company in the best position it has ever been to finally generate recurring revenues and profits. We think the shares will get revalued as numerous development projects begin to generate sustainable revenues growth. At first, it's somewhat hard to grasp JOE's vast land holdings, numerous development projects, capital spending, history and the qualities of each development project. Having visited each location and met with JOE's CFO, Marek Bakun, recently at JOE's headquarters, the following is a summary of our research. The company has been through 4 stages since the 1930s. First, a timber and paper company. Then, during the housing boom, they were a large-scale and high-cost development company, supplemented largely by land sales. After the housing bubble burst, there have been about 12 years of the area's recovery as JOE instituted cost controls and refined their strategy. Now, as we see it, JOE can finally capitalize on its real estate holdings, and the shareholders can benefit. 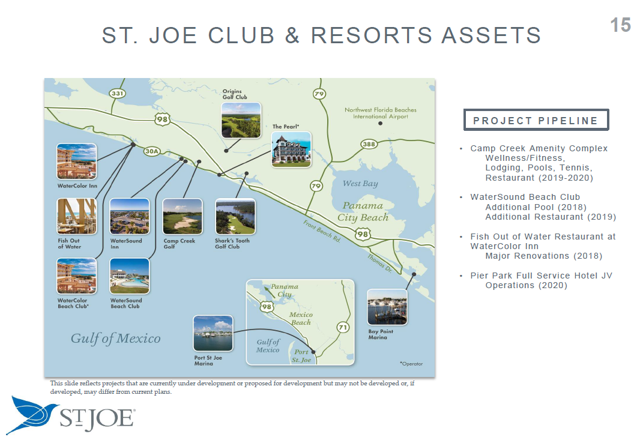 We would describe JOE as a REIT-like company with very large land holdings (carried at almost no costs) that is focused on recurring revenues from leisure, commercial, hospitality, and to a lesser degree timber sales. Revenues are also supplemented with residential lot sales. The company's name "St. Joe" is from the town of "Port of St. Joe". JOE does own some real estate around the Port of St. Joe and the marina, but the bulk of the land is near Panama City Beach (or PCB). PCB area (Emerald Coast) has the best beaches and clearest water anywhere in America. Photo: Author's photo. In 1936, JOE was spun out of the duPont Trust as a timber company. At one point, JOE owned 1 million acres in Northwest Florida, and the book value was a few dollars per acre. Currently, JOE has 177,000 acres, having sold off much of the timberland in the past. The biggest plot of land is adjacent to PCB and roughly 15,000 acres around Tallahassee. Here is a map of JOE's land holdings and how far from the coast the property lies. Source: JOE's May 23, 2018, corporate slide deck. JOE's biggest continuous plot of land is approximately 155,000 acres adjacent near Panama City Beach ("PCB"), FL., in Bay and Walton Counties. The land lays along the two major highways, coastal highway 98 and north/south highway 79. The majority of this land, 110,000 acres, is within the approved Bay-Walton Sector Plan. It's fair to say that JOE got over their skis on development in the housing bubble and made investment mistakes. There have been management changes since. Bruce Berkowitz is currently the Chairman of the Board, and his fund, Fairholme, owns approximately 44% of the stock. Fairholme first went over 5% ownership of JOE's stock in 2010 (Source: SEC 13D filings). In 2011, Mr. Berkowitz was elected onto the BOD and became Chairman of Board of JOE. It should be noted that Mr. Berkowitz receives no compensation or stock options for being on the Board and never has. He also runs an investment portfolio for JOE's liquid assets at no charge. This is rare. From 2011, the corporate overhead has been cut from $50m to the current $20m. We have confidence in current management. Available on the net, Kerrisdale Capital, in April 2018, did a short thesis piece on JOE titled, "Mired in Swamp". Although a creative title, most of the Bay-Walton Sector Plan is 50-80 ft above sea level, which is a high elevation for Florida. Compare that to the elevation of the multi-million-dollar homes in Naples and Marco Island. The Bay-Walton Sector Plan land is predominately pine forest. We visited Pier Park North on Monday, 11/26/2018 at 2 p.m., and the shopping center was vibrant. Pier Park North and the next-door Pier Park (not owned by JOE) is by far the predominate shopping center area for 250,000 residents of Walton, Bay and Gulf counties for about 40 miles in any direction. This shopping center also caters to above average spending vacationers. According to the FDOT, the average daily traffic count on highway 98 and Pier Park North is 47,500 vehicles per day. This road is in the design phase to go to 6 lanes from 4 lanes now. We give credit for Kerrisdale for doing an in-depth static analysis, i.e. the projection of the past into the future, which if always applicable, librarians would be rich (a Buffettism). We acknowledge predictions based on dynamic analysis are not riskless. A reader can estimate the value of JOE's land from the landwatch site. It turns out that the value tends to drop off roughly logarithmic with the distance from coast (unless located by a major highway or development). 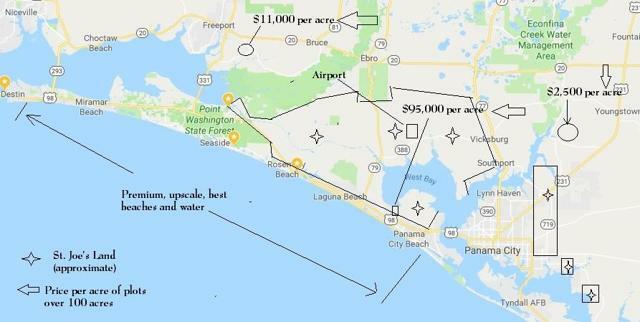 In 2012, Jefferies Financial Group (previously Leucadia) paid $52m or $73,446 per acre for the 708-acre old Panama City Airport (in an older part of town) Source: Jefferies 2012 SEC 10K. A meaningful portion of JOE's holdings is in proximity to this $73,446 per acre land purchase. The market value of JOE is $1b, and the land holdings are 177,000 acres, so the basic calculation of JOE's land is worth (according to the stock market) $5,600 per acre. This per acre calculation would exclude their well positioned 3 golf courses in the western, i.e. highest value, portion of their PCB holdings and their clubs and resorts. 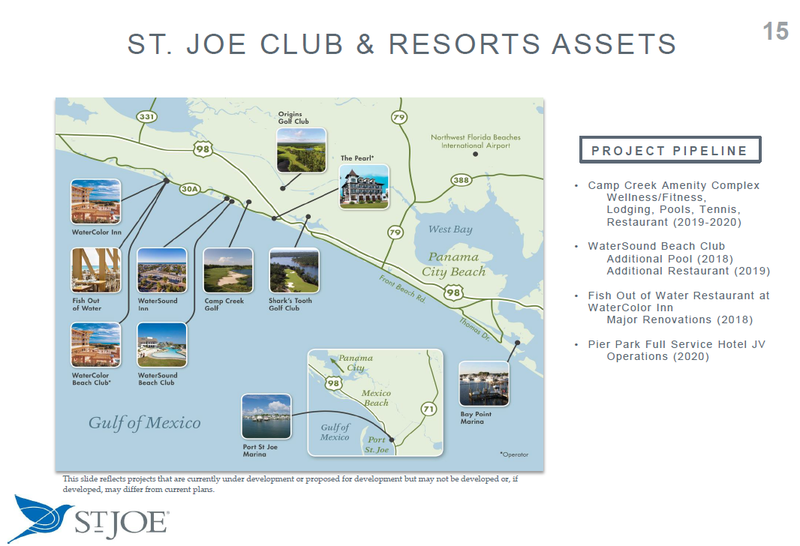 The graphic below has a map of JOE's clubs and resorts. Source: JOE's May 23, 2018, corporate slide deck. We have visited the PCB area four different times. First was in 2010, when the area was still reeling from the housing bubble collapse. 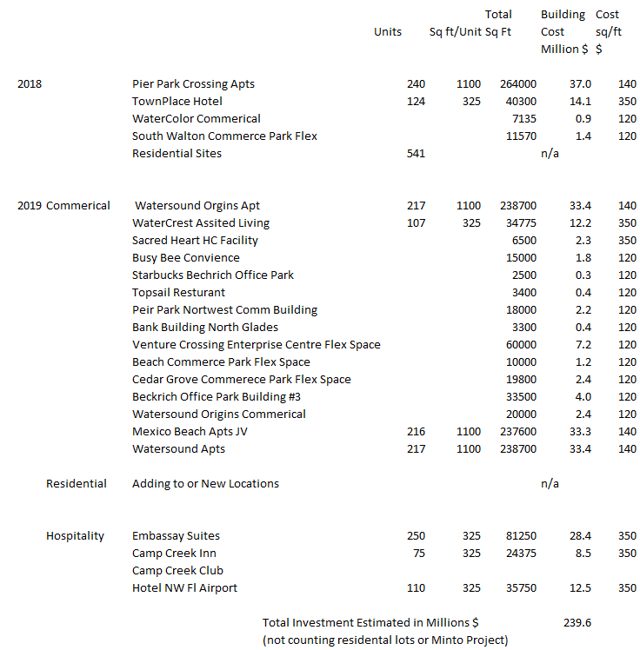 When I visited JOE's WindMark development near Port of St. Joe along the coast, it was obvious that this and other investments should be written down. In 2012, our interpretation was still the same, many of JOE's developments should be written down. There was little or no activity at these developments. In 2014, the interpretation of JOE's assets was that things had stabilized in the area, but there was no reason to invest at that time. We again visited PCB (Nov. 2018) to see all of JOE's holdings. We traveled from Tallahassee (Southwood development) to Topsail (35 miles west of PCB) and to RiverCamps Development just south of the PCB airport and all points in between. This time, we also met with the CFO of JOE. With the stock being at a long-term low and numerous announcements of new developments by the company and seeing the bulldozers leveling land for development, we became interested. It should be noted that D.R. Horton is currently building homes at WindMark. In 2010, there was just the sound of crickets at the development. In a very recent news release from JOE, D.R. Horton has purchased an additional 94 lots at WindMark from JOE after buying 64 lots in 2017. Things are going the right way now at WindMark. The condo market has rebounded, and for the first time since the housing meltdown, a new large condo along the coast is under construction. 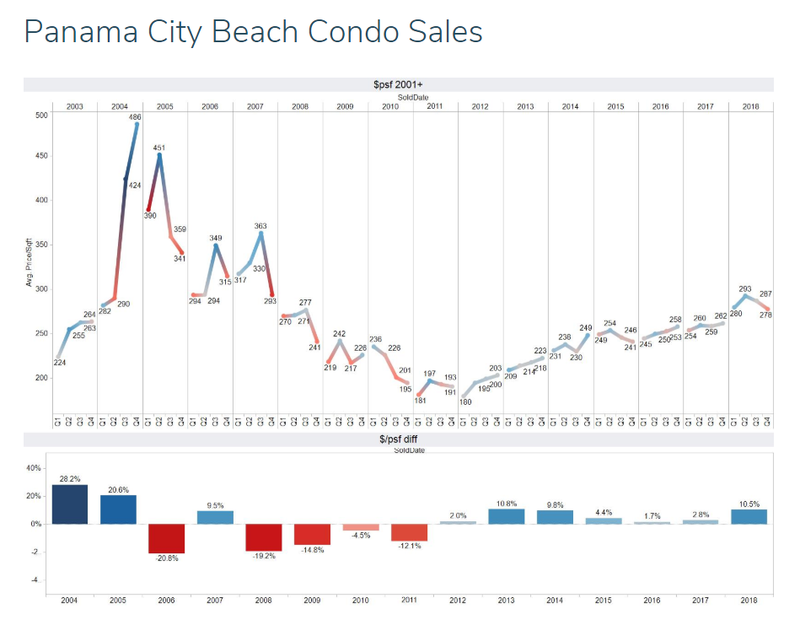 Here is a chart of the price of an ocean side 2 bedroom condos roughly 1,100 sq ft. The condo prices bottomed in 2012 at an average of $180k and have increased each year since 2012 to a recent $278k. 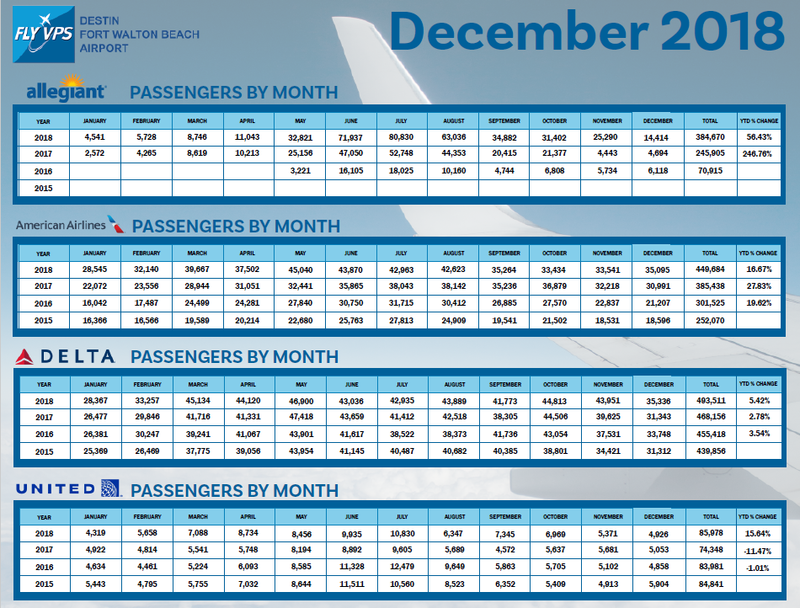 The first set of figures are Dec. 17 to Dec. 18, the second set are for the 12 months ending in Dec. 18. Total traffic for 2015 (graphic not shown) was 890,764 for a 3 years gain of 18%. Total traffic in 2015 was 776,767 compared to 1,413,843 in 2018 for a gain of 82%. Looks like Allegiant has really driven the numbers here. Minto will soon be starting a Latitude Margaritaville development approved for 3,000 homes. Minto should be breaking ground by this summer. Kolter Homes, a large SE USA builder, has committed to putting in 466 homes at Origins. JOE and Busy Bee are constructing a new convenience store along highway 98. A large format store. Busy Bee has a destination stop along Interstate 10 that people in PCB are familiar with. JOE itself is adding 359 new home sites at the Origins development near Kolter's 466 home sites. In addition, JOE has planned a hotel on their own land (Venture Crossings) near the airport and an apartment complex near their Pier Park North retail properties. Also, on the east side of Panama City (Brannonville, Titus Road, and Park Place areas) JOE has announced other residential developments for moderately prices homes. JOE is developing higher end homes at Origins, at Breakfast Point (middle income homes), and moderately priced homes on the east side of Panama City. JOE is also adding apartment housing and commercial. Following is a map of some of the areas mentioned above. The green shaded areas are part of the Bay-Walton Sector Plan. 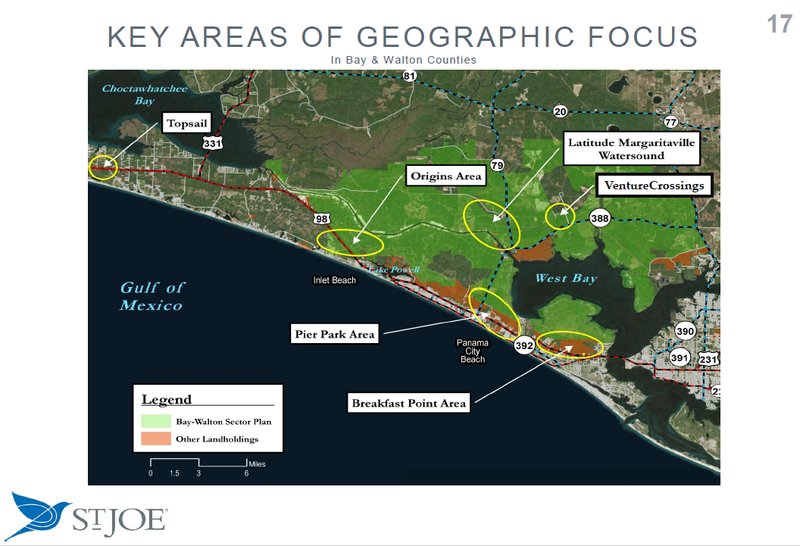 The brownish/orange areas are developments and land JOE owns, but are outside of the Bay-Walton Sector Plan (notably the Pier Park area, Topsail and the Breakfast point development). Source: JOE's May 23, 2018 corporate slide deck. It's easy to see when the housing bubble happened, the stock reached $85. Since then, PCB recovered from the housing bust at the same time JOE was getting its overhead in line with its business strategy. 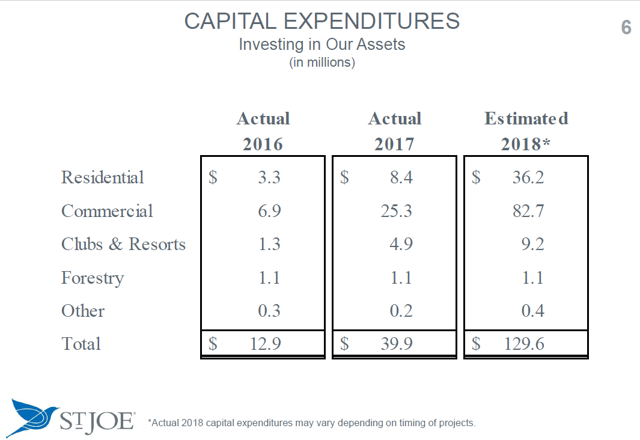 Below is JOE's previous capital spending and 2018's projected capital spending. JOE missed estimated 2018 capex. The actual was $45m. Yet, from the numerous projects announced and seeing bulldozers working at several locations recently, capex for 2019 and 2020 should be close to or exceed the $129.6m estimate for 2018. We should get updated soon by the company for new capex projections for 2019. Capex should be up roughly 10x or more in 2019 from what it was in 2016. The reason for the recovery is that the PCB has recovered from the housing crisis and JOE's strategy of targeted JV projects has caught traction. There is only one analyst for JOE and that analyst, as far as we can see, has not changed his rating from a hold rating since mid-2015. At one time, JOE was spending $500-600 million per year on development. Cumulatively (2001-2007), they spent over $3b on development. Some of this spending has been written off and lost. Some of the projects were sold like the SevenShores development (now called Harbour Island) in 2010 near Bradenton, FL and the RiverTown development near Jacksonville, FL in 2014. Other projects that they kept probably should have been written down more severely after the housing bust, but they are now starting to bear fruit. 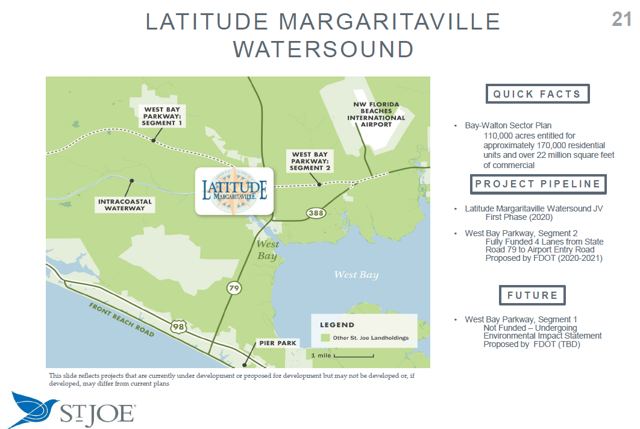 Such as areas like the WindMark Development near Port of St. Joe and Origins at Watersound. Investors should benefit from previous development capex that looked sunk after the bubble burst that is now starting to pay-off. Source Data for graph: JOE's 10Ks. At one time, JOE's corporate overhead was $120 million per year. It's now $20 million. Capex on development projects per employee is hitting a record, and corporate overhead to revenues are also at a 13-year low (graph not shown). This is a solid indication that revenues will grow and profits will fall to the bottom line. Source Data for graph: JOE's 10Ks. We also visited the small-town of Freeport, FL. Population 2360. A town 20 minutes north of the coast and 25 minutes to any shopping. A 40-minute drive to either Destin or Pier Park. Until very recently, other than a gas station, there was almost nothing in Freeport. For the size of the town, new homes are selling well. In 2018, they sold 111 homes in Freeport, 35 of which were built in 2018. The proximity and direct route to the beach areas and the lower costs are motivating factors for housing demand in Freeport. JOE is capitalizing on this demand with apartment developments, and expansion of the Breakfast Point development and 3 developments on the eastern side of Panama City where land values are more moderate. Here is a prediction made by "30A" about Freeport, JOE and the Panhandle beaches area 3.5 years ago. "There is growing demand for houses, apartments, limited and full-service hotels, clubs and resorts, and office space for work, life, and play in what Forbes calls "The Hamptons of The South". St. Joe initiated a record number of projects for 4,600 homes and 490 hotel rooms while buying back common stock with excess liquidity last year. Depending on scope, projects may take between eighteen and thirty-six months to show profits." Source: Fairholme Funds, Q4,2018 Annual Report. For example, Pier Park Crossing 240-unit apartment complex was announced on April 18,2017, and has now started leasing about 2 years later. The cost was $36m or $150k per unit (without land costs). Normally, land costs are about 5-20% of a total project's costs. It appears from the Bay County Assessors site that this 3.11 acres was valued at $558K per acre when transferred to the JV that owns the complex. We come up with the estimated capital spending over the next 2.5 years. *Source: Author's Spreadsheet based on company data - The details of the JV projects are not public information. In each case, we assume JOE pays for the development costs and either leases the property back to the JV partner or operates the property via 3rd party management company. We make the assumption that approximately $17.50 per share is the dead business value, i.e. about what you could sell JOE for in a quick liquidation or what the company is worth when there is little capital investment to grow the business. The market has plenty of time to mark JOE's stock down to a lower value. Adding up the development costs, JOE should add approximately $4.00 per share ($240m) in recurring revenue assets book value over the next 2.5 years. They will also add to their book value by residential lot building (not included in our estimate). If we make the simple assumption that JOE's stock goes up approximately as fast as the nonresidential book value goes up, then based on a $17.63 stock price, the return per annum would be about 8.5% per year. 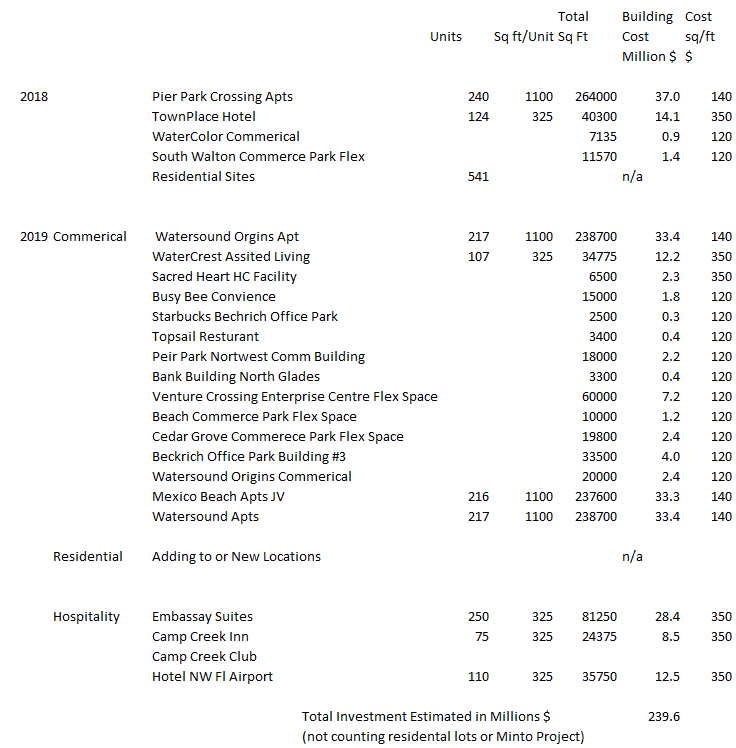 Assuming all these projects go forward, JOE's economic book value will go up faster than what was stated because the cost of the land JOE is putting these projects on has almost a nil book value. For example, the Busy Bee they are building along Panama City Beach Parkway, i.e. hwy 98. They are using 2.6 acres for this 13,000 sq. ft. building. Estimating building costs at $120 per sq. ft., the cost for the building costs is $1.5m. The land cost is roughly $500k per acre or another $1.5m. We assume that Busy Bee will pay based on the economic book value of the project. We assume a cap rate of 7% (normal REIT cap rate). JOE's return will be nearly double the cap rate because the land costs are essentially nil. JOE's returns will be closer to 14%, not the 7% your average REIT would be getting by buying the land at current rates. Of course, not all projects will get boosted this much. The Pier Park Crossing Apartments won't because the land costs are not as high as the percentage of the building costs. Yet, JOE does have a unique position and value added that most other real estate development companies don't have. JOE also has revenues from residential lot sales. We assume between existing commercial, resort, timber, and residential lot sales, this will cover the corporate overhead. If JOE sells more lots than normal (roughly 200 lots sold in 2018), then there will be an upside to our estimate. Lot sales have historically earned 50% gross margin, and since the corporate expenses are covered by existing revenues, the net margins on lot sales will be high. There is upside possible here because JOE has opened several new residential development sites. We have not figured any revenues from Minto's Margaritaville project. JOE should get some revenues from this in 2021. Minto will be breaking ground sometime before the end of this summer. From the 10K JOE generates, 79% of its revenues are from 2% of its land holdings. T. Rowe Price has recently increased their holdings of JOE to 10.5% and Vanguard has increased their holding to 8.8%. Fairholme Fund owns 44%. Blackrock has been exiting their position and is now under 5%. Source: SEC filings. Besides Bruce Berkowitz, we would like to see members of management and board members own considerably more shares. 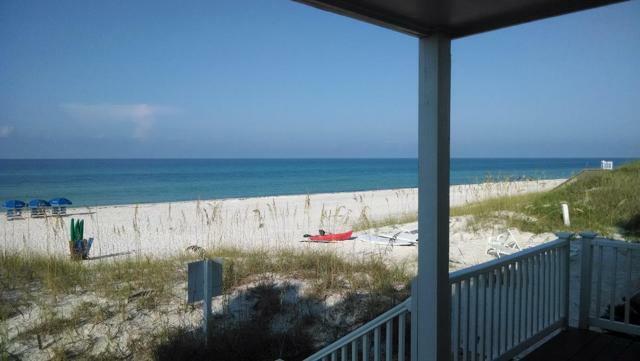 PCB area relies on the vacation and hospitality segment for revenues. A theme park or other large venue in the area would be beneficial. PCB area will also need to continue to grow the commercial/industrial and retirement segments. JOE will have to continue to announce new projects to grow earnings past 2021. The PCB area has never been on such a sound footing. JOE's management is doing the right things, and insiders have consistently purchased shares recently. Besides Fairholme, we would like to see the size of their purchases increase. Many third parties have decided to invest in JOE's development projects. JOE's cost structure is currently covered by recurring revenues, and additional revenues will turn to profits quicker, i.e. JOE has operating leverage for the first time since the company got into land development. JOE will only need to add a few project managers to expand recurring revenues. 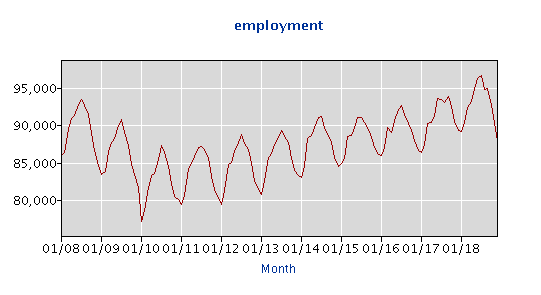 Assuming a stable local economy, JOE's future is the brightest it has ever been. It's very likely that JOE's earnings will rise in the coming 2-3 years. If so, the shares will get repriced. As Ben Graham once said about an early purchase of GEICO in 1948. "Walter, if this doesn't work out, we can always liquidate it and get our money back." We think JOE is in this ballpark too. Disclosure: I am/we are long JOE. I wrote this article myself, and it expresses my own opinions. I am not receiving compensation for it (other than from Seeking Alpha). I have no business relationship with any company whose stock is mentioned in this article. Additional disclosure: This article is not an offer of solicitation, or an offer to buy or sell any securities, it's for informational purposes only. Any offers of solicitation would violate securities laws. Any investment involves substantial risks, including, the potential complete loss of principal. If your investing money, wear your big boy pants. This article contains forward -looking statements that are not statements of historical fact. Estimates could be wrong. Investors should do their own due diligence before making an investment decision.